Rome, as we all know, is a historic city that breathes in over 3 millenniums of history and culture. It’s one of the most historically relevant cities on earth, having been home to the great Roman Empire. Even now that sense of majesty and romance is still retained in the city, and it has architecture and buildings that seem unfazed by the passing of time. 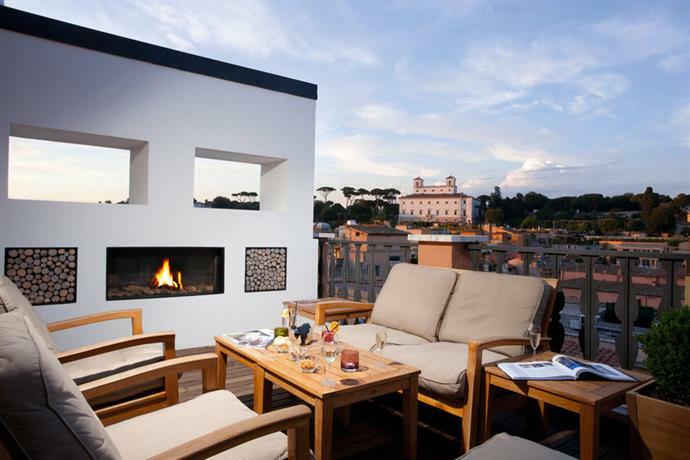 If you’re visiting Rome, you should stay in one of the following boutique hotels. 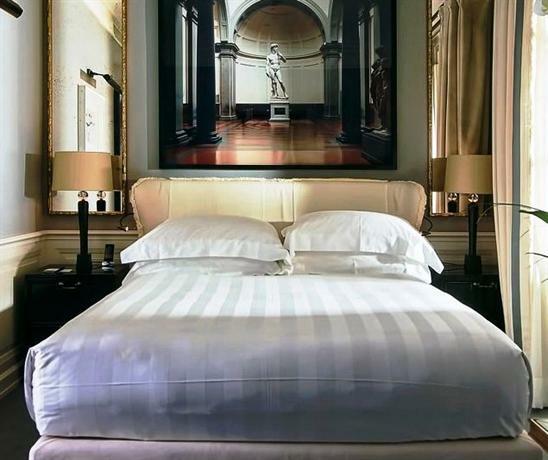 The Portrait is one of the best boutique hotels in Rome located in Via Condotti which happens to be the most fashionable street in Rome, replete with some lovely fashion boutiques and cafes. If you’d like to do a bit of sight seeing, you can simply walk over to the Spanish Steps and the Trevi Fountain. One of the things that makes the Portrait stand apart is the fact that it has been designed and maintained to give off the vibe of a private residential area, rather than a hotel. The aesthetics of the hotel are classy, and they’re occasionally made grand and vibrant with randomized splashes of color. The hotel has been built over a Ferragamo store, and instead of shirking away from that connection, the hotel whimsically embraces it. They have little shoe designs on the silk curtains, and they even have some framed photographs from the store’s history. This gives the hotel a sense of history, weight, authenticity, and whimsical charm. 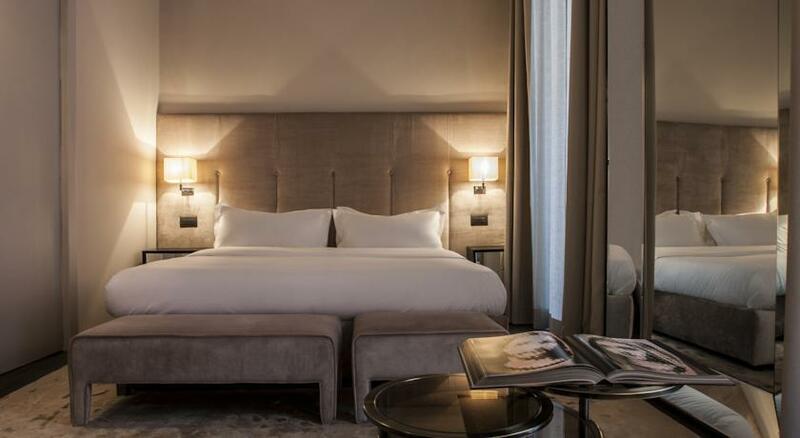 The Roman suites and rooms are stunning, grand yet subtle, sweeping and open, yet cosy and intimate. It’s hard to resist the temptation of simply lying on the fluffy beds and ordering in wine and breakfast and never leaving the room. The walls and carpets feature earthy neutral tones, but that neutrality is off-set against some rich and intricate brocaded fabrics on the curtains and the upholstery on the furniture. Another whimsical and charming aesthetic detail is the presence of a visual fireplace in some of the rooms. The J K Place is located a mere five minutes away from the Spanish Steps, and it’s also within easy reach of the Vatican. As such, this is the place you’d want to be if you want easy access to the formidable weight of the Roman Catholic Church. As far as location is concerned, even though the hotel is accessible and well connected, it’s also a bit inconvenient in an immediate sense. For example, the lane that leads up to the hotel is extremely narrow, so much so that you fear the car may just get stuck, and the hotel doesn’t have a lot of open space around it. However, what it lacks in the immediate vicinity, it makes up for with the stunning decor and the interiors. The decor is extremely boutique, with a retro Dolce Vita aesthetic leaning. There’s a sense of restrained self-aware opulence all around, and every aspect of the hotel, and every detail, is well stitched together so that every room feels unique yet a natural part of the larger hotel. The ground floor of the hotel also features a lounge and a library area, and as such the aesthetic here is definitely masculine, kind of like a gentlemen’s club. There are 23 rooms and 7 suites in the hotel, and they’ve all been decorated in an impeccable aesthetic standard. Depending on the room you’ve taken, you’ll either be met with a steel grey aesthetic, or a petrol green one. The bathrooms have been designed with white and grey marble installations. As such, the entire hotel feels lush and hip. The Fifteen Keys is located on a quiet corner of Monti, which happens to be the most hip and trendy neighborhood in all of Rome, with streets flanked by charming cafes and boutique shopping outlets. The Colosseum, which happens to be one of the most popular landmarks in Rome, happens to be within walking distance. So if you’d like to be able to witness the remnants of the grand Roman Empire, you’re ideally suited in this boutique hotel. The hotel is really more of a townhouse, and as such it also has an intimate feel that most hotels lack. You can well imagine yourself spending several days or weeks in this establishment. From the outside, the building has a pale cream exterior, however the interiors are extremely hip, vintage, and retro all rolled into one. For example, the armchairs in the hotel have been designed in a retro 1950s style, the lighting is soft and warm with vintage fixtures, and as such the hotel feels warm and lively. Another great aspect of the hotel is that it’s staffed 24/7, and as such even if you want to order some snacks at 3 in the morning, you can do that. If you’d like to travel around Rome independently, you can also borrow one of their dudebike bicycles, free of charge. There are 15 rooms in the hotel, all facing the courtyard, and they’ve been decorated in either a light parchment shade, or in grey, or in a dark vitriol blue. The Princeps Boutique hotel is located on Esquilino, which is the highest of the seven surrounding Roman hills. It’s a short 10 minute walk away from the Colosseum, and if you’d like to travel around the city, you can grab the Termini railway station which is also within walking distance of the hotel. If you’d like to go shopping at some boutiques, or if you’d like to explore some eateries, you can walk over to the Monti district, which is famous for its cafes and restaurants. 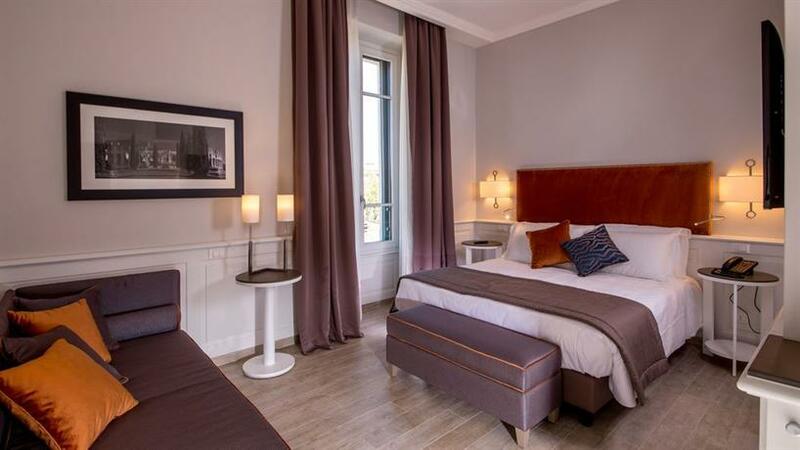 There are 20 rooms in the hotel and most of them have a clear view of the Esquilino square, with the obelisk facing towards the Santa Maria Maggiore, which is a structure that has been standing since the 4th century. This is an intimate and friendly boutique hotel with a minimalist and contemporary look owing to its predominantly grey and white color palette. The rooms follow the generally minimalist aesthetic of the hotel, however it’s made a little warmer and more personalized thanks to the wooden furniture and fixtures, and the fact that the rooms bear tiny details like vases or sculptures from local artists. 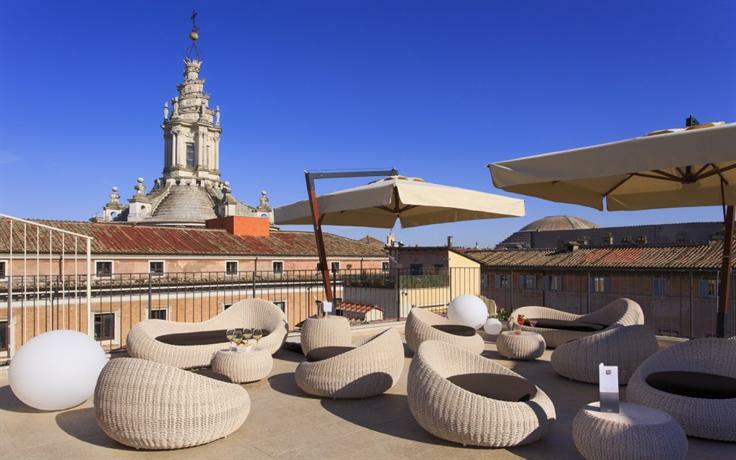 The rooms look out over the Esquilino square, or they look out over the roofs of Monti. Either way, the view is fetching because the city itself is fetching. 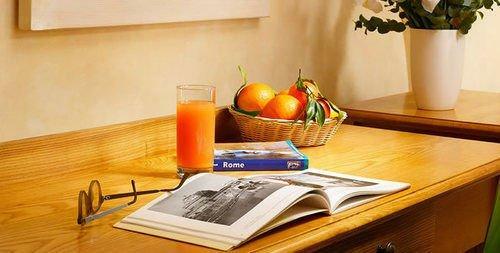 The Del Senato is a boutique hotel located beside the Pantheon, which forms the center of Old Rome. This is usually a quiet street and doesn’t see much traffic, so if you’re hankering for some peace and quiet this is perfect. 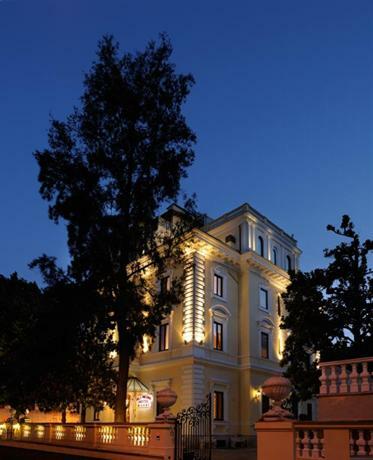 The hotel has been designed in a classic Roman style, traditional and full of antique furniture and sculptures. Even though the hotel features all necessary modern amenities, care has been taken to not interrupt the historic feel of the hotel. 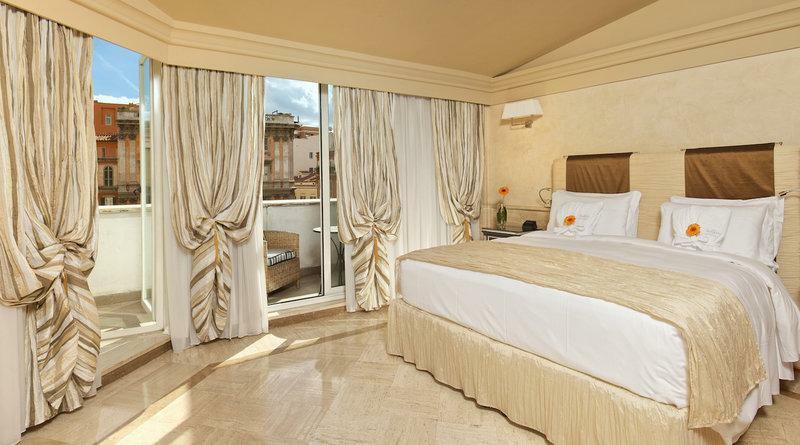 If you’d like to stay in a hotel that perfectly captures the historic beauty of Rome, this is ideal. However, if you prefer modernist architecture, it’s best to stay away from this. The lobby of the hotel has a polished glean to it, and it’s always fragrant with fresh flowers. The best rooms in the hotel are those facing front, especially considering the side-facing rooms can often get dark and dingy with little in the way of natural light. The hotel has a really rich and intimate aesthetic sense, with brocaded fabrics for curtains and rugs, and even the walls covered with silk brocade. The best room in the hotel is doubtless the Penthouse Suite, which offers a stunning panoramic view of the city. Another great thing about this hotel is the accommodating service. If they’re not entirely booked out, and if it can be arranged, they’ll gladly shift you to another room in the hotel for no additional charge. The Santa Maria hotel is located in a stunning and charming neighborhood with cobbled pavements and lanes that are for pedestrian use only. It’s located on the left bank of Tiber, and it’s flanked by gorgeous cafes and boutiques all around. The most intimate and interesting aspect of the hotel is the fact that it consists of a series of single or two-storey buildings, all set around the central garden. As such, it feels wonderfully rural and natural. This is a boutique hotel without spas and swimming pools, however they do offer bicycles for free, and the general aesthetic that they embody is very lively and friendly, and that makes it all worth it. The Palazzo Navona is located smack right in the middle of the city, and is ideal if you want to spend your time in Rome simply exploring all the various attractions that the city has to offer. If you’d like to do some shopping, then you can walk on over to Via dei Condotti, which is the major fashion strip of Rome, replete with high-end outlets. The aesthetic embodied by the hotel is contemporary and modernist, with the ground floor being made entirely of glass walls. This makes the entire hotel very bright as well. There are 43 rooms, and they have been designed mostly in earthy shades of apricot brown, dove grey, and pristine white. The Barocco is located in Piazza Barberini, which happens to be one of the most charming piazzas in Rome. 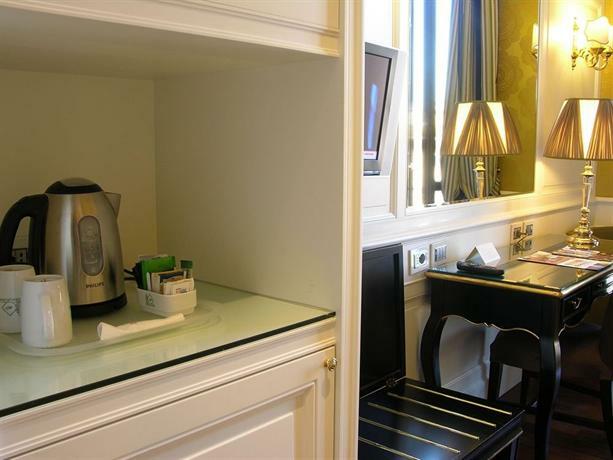 One of the most stunning aspects of this hotel is that all the rooms have a clear view of the Tritone, which is one of the famous fountains in Rome. If you’d like to go shopping or exploring charming eateries, you can simply walk on over to the neighboring Via Veneto. The hotel has been designed in a rather opulent aesthetic style, full of gold embellishments, designed in a baroque style with earthy decor and marble pillars. 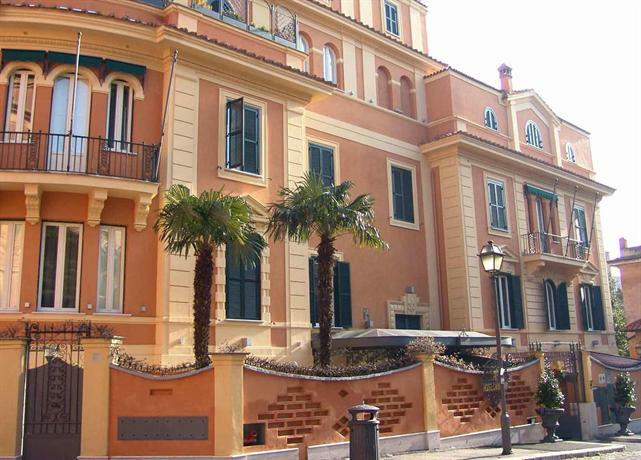 The Hotel San Anselmo is located in Aventine perch, and as such is sequestered from the buzz of life in Rome, however it’s close enough so that you have access to it still. This location is sure to be of interest to you if you’re into history, because it’s quite close to Circus Maximums, one of Rome’s prominent archaeological areas. Even the Colosseum is within walking distance. The hotel has a really loving and warm vibe to it, designed largely in a turn of the century aesthetic style, with a spattering of contemporary and modern art hanging on the walls. The Babuino 181 is located in one of the most fashionable districts in Rome, perched between Piazza del Popolo and Piazza di Spagna, both of them replete with boutique stores and lovely cafes and restaurants. The entire hotel has a very intimate and contemporary aesthetic. 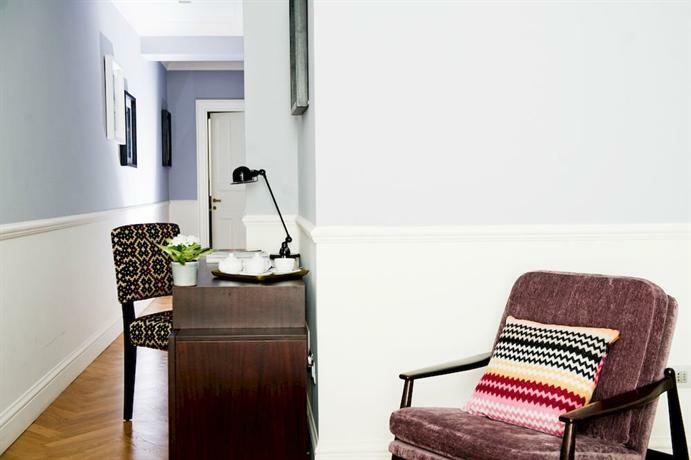 It’s really more of a townhouse with a friendly staff so it feels like being home. The interiors of the hotel feature grand stairways made of marble and Art Deco motifs that give it a hip and cool vibe. There are 14 rooms in the hotel and they've all been designed in natural wood, and shades of ochre and bronze, so as to feel warm and inviting. 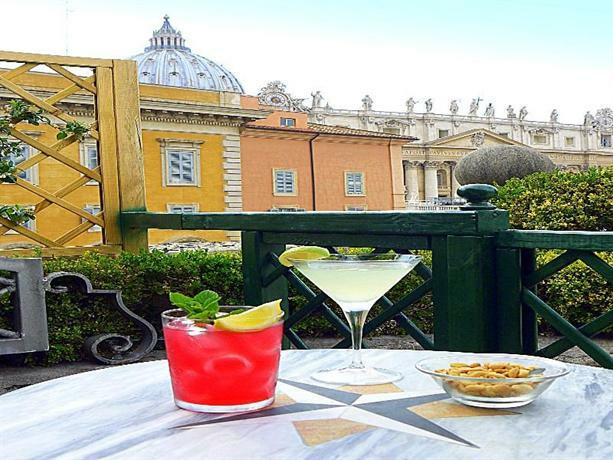 This hotel is located in the Vatican extra-territory, and as such it’s the perfect location for those who have come to visit the Vatican city. In keeping with that, the hotel has a pious vibe to it, though it’s still extravagant and lovely. It’s a baroque palace resplendent with bright colors and marble fixtures. The walls are graced with contemporary works of art. The boutique hotel had first been designed as a monastery, but was then transformed into a hotel. 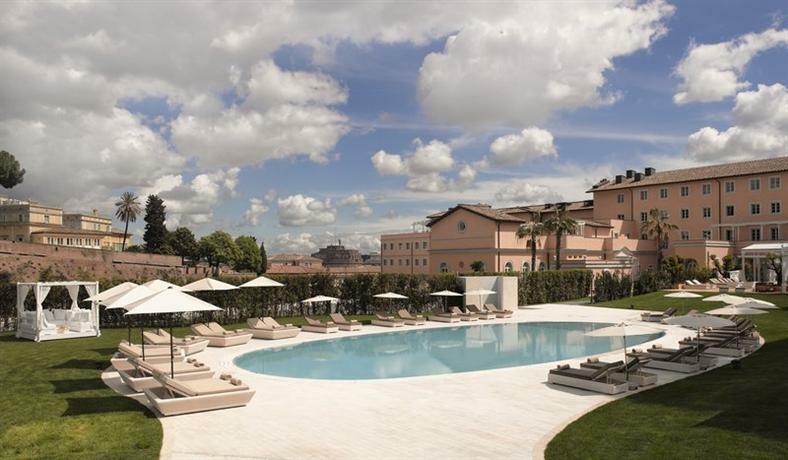 The Gran Melia is located equidistant between the Trastevere and Vatican areas. The hotel has a really hip and even eccentric vibe, it’s contemporary, chic, and ultra-modern, but with a renaissance twist. The hotel is mostly pristine white in color, and it features large floor to ceiling windows to allow plenty of natural light in, but that minimalist style is off set with the use of renaissance period Roman and Italian furnishings. 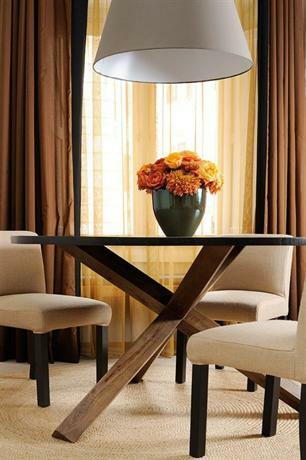 There are 116 rooms in the hotel, and all of them are bright, breezy, and feature light wood panels and stone floors. The Hotel Villa Pinciana is a very hip and trendy hotel located very close to the Barberini metro station. The Colosseum is within 3km of the hotel, and as such it’s quite well connected. The general aesthetic of the hotel is light, bright, and extremely elegant. One of the great things about the hotel is that you get free WiFi in all of the rooms, along with complementary breakfast as well. 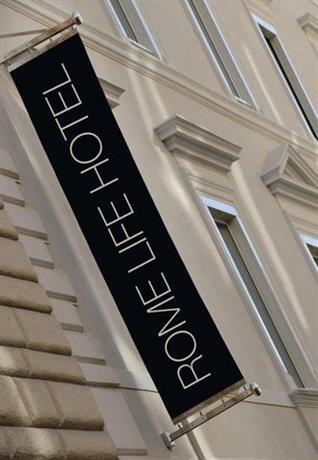 This trendy boutique hotel is quite well located, equidistant from the Colosseum and the Villa Borghese gardens. If you don’t mind a 3km walk to sightsee, that’s great, otherwise you can easily find transportation around the hotel. St. Peter's Basilica is a short walk from the hotel. The hotel has been designed in a 17th century palatial style, with high vaulted ceilings, beams, and stone floors. The Rome Life has one extremely attractive feature — it’s so close to the Colosseum that they’re practically neighbors. The hotel is trendy and designed in a contemporary style, with a wooden facade. The rooms are all modern and minimalist with contemporary artworks and details. The hotel is also known for its impeccable service, and you get complimentary breakfast as well. This is a great hotel for you if you’re traveling on a budget, and if you still want to be in a central location.